Many Russians will know what a temnik is. But only a few can claim to have seen one. In journalistic jargon, the temnik – a word derived from the word “theme” – means an instruction from the authorities, which is disseminated among the media. A temnik tells which themes to cover, who is to be treated positively, who should have negative coverage and who should be altogether ignored. 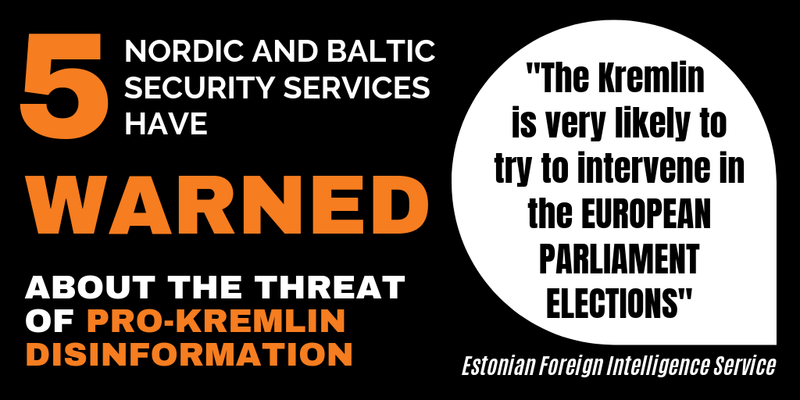 The temnik system has replaced the old style reactive approach of censorship with a proactive approach of guidelines. A Russian editor will know from the temnik where the no-go zones are, i.e. how to avoid getting into trouble with the Russian authorities (see our timeline of government crackdowns on Russian media that have overstepped the Kremlin’s red lines). But temnik also contains the Russian word for darkness, temnota. As opposed to Ukraine in the early 2000s where the temnik term was originally coined, the modern Russian temnik is not a written genre, but an oral practise. It is carefully kept away from plain view in the darkness of deniability, as it is spread from the political top and down through the media system in the form of oral policy briefings. Top managers attend meetings where they listen to monologues, the main points of which they then relay at meetings with their subordinates, who then share the same narrative with their teams, etc. The policy reaches the bottom from the top, and the job of those further down the chain is then to pitch proposals on how to storify the policy. 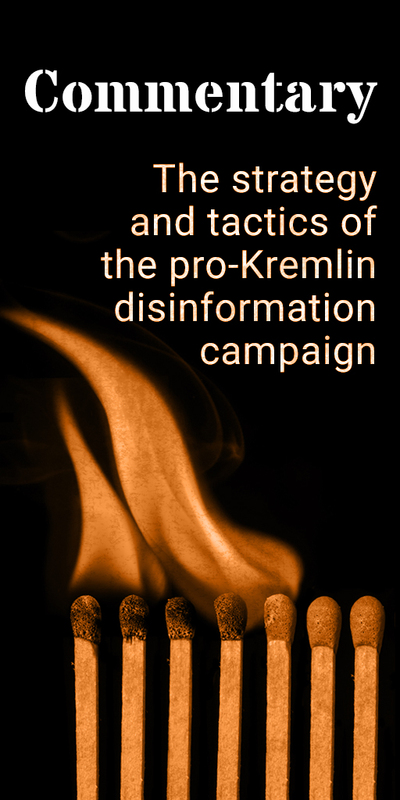 Media attacks, disinformation and other kinds of propaganda appear not only as as a result of direct orders, but also – and perhaps mainly – as the bottom’s wish to create stories that satisfy the hierarchy and comply with the policies expressed in the briefings. Being a part of this system of oral exchanges, the temnik system normally casts its shadow when we witness the high degree of coordinated messaging in pro-Kremlin media. However, the moment when the temnik becomes most evident is that rare situation when something happens which is at the same time unexpected, extraordinary and of strategic importance to the Russian authorities. Such a constellation leads to an eclipse in the form of sudden silence during the period in which the media outlets are waiting for the policy of the temnik to be formulated. The last time we saw this happening was during and in the immediate aftermath of this Sunday’s protests in Russia. The events on Sunday were as simple as they were disturbing for Russia’s authorities. The video inquiry into Prime Minister Medvedev’s alleged corruption scheme, which opposition leader Alexey Navalny’s NGO had produced (see our story), had gone viral, and so did Navalny’s call to take to the streets in a coordinated protest, which was what happened on Sunday in 99 Russian cities. In Moscow alone, more than one thousand Russians, many of them teenagers, were detained for peacefully exercising their constitutionally guaranteed freedoms of speech and assembly. But the pro-Kremlin media outlets were silent. Finding themselves in a waiting position for the temnik, they talked about everything but the mass protests. Propaganda expert Alexei Kovalev boiled the media’s silent reaction down to one tweet: “Russian TV right now: There’s corruption! (in South Korea) There are protests! (in France) This state is a failure! (it’s Ukraine)”. In other words, pro-Kremlin media spent their time paddling in Freudian slips of “whataboutism”, indirectly addressing the problem in Russia they knew very well about, desperately pointing at somehow similar problems abroad. But still, not a word about the events in Russia. At one point it became evident that a policy was finally being formulated: temnik lines began to spread among pro-Kremlin media, but with a high degree of caution. Television, which is still the preferred medium among the majority of the Kremlin’s core voters, remained silent. Instead, the lines were more carefully disseminated via online media and radio. As Alexei Kovalev noted on Facebook, online outlets belonging to leading Kremlin-loyal TV stations and news agencies began to formulate “rare references to ‘arrests during the opposition’s unsanctioned protests, during which a policeman was beaten’”, but, as Kovalev noted, “nothing is told about what the protesters were protesting against.” “Morning radio has worked in strict accordance with the temnik”, Kovalev wrote on Tuesday afternoon. 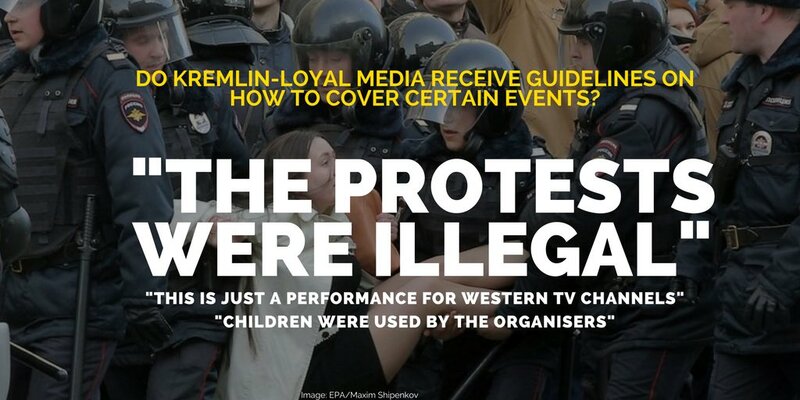 Here, Russians were warned that the protests were “illegal, a provocation, children were used [by the organisers], they want to return to the 90s, they want what happened in Ukraine, this is just a performance for Western TV channels”, Kovalev summarised. Glimpses of the way the temnik system works can also be seen when top managers of pro-Kremlin media express themselves on their personal social media accounts. One of the most important sources is Margarita Simonyan, the CEO of Russia Today (RT). Although intended as an anecdote to downplay the importance of the protests, her testimony, expressed in one tweet, can be read as a report back to her Kremlin hierarchy: “My relatives from Adler [in the South of Russia] came to visit. I: How did the rallies go in your part of the country? – What rallies? – The protests. – Against whom? – Against Putin. – Against Putin? Such bastards!” Simonyan’s message is clear: The most important segments of Russian voters know very little about the protests and – what is perhaps most important – they do not care.